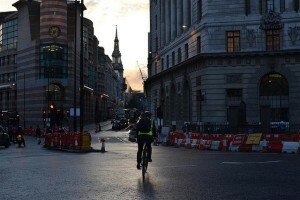 Another cyclist hit by a truck in London has died. This time it's a 21 year old woman who was in a collision with a tipper truck on Sunday 15 September along Houndsditch. She was taken off her life support over the weekend and died on Sunday. She is the eighth cyclist to die on London's roads this year; the sixth involving a lorry. So the proposals to make all HGVs carry safety features or be fined should come into sharper focus for London's increasing cyclist population, but perhaps Hackney will be campaigning hardest. Why? Well, we've come across a nice map that demonstrates where the city's most ardent cyclists live. (It's been produced by a personal injury lawyer which is a bit, uh, distasteful and why we're not embedding it, but you can see it on their website.) It's already been shown that Hackney has the highest percentage of people who commute by bike – around 15% – but the map breaks two-wheeled commuters down into the top 100 neighbourhoods. Hackney takes 13 of the top 15 spots (Mildmay and Highbury East in Islington muscle their way in there). What's noticeable is how often the same boroughs keep cropping up: Hackney, Islington, Tower Hamlets, Lambeth, Southwark, Wandsworth. It's probably not a coincidence that many of these boroughs have cycle superhighways through them, though Westminster, Lewisham and Greenwich should take a hard look at themselves and ask why they're the only inner London boroughs not to appear in the top 100.